Prim-wise, it's at 406! I am not sure how to count the scripts, but I'd say there's about 400-500 total. No fooling-- my scripting knowledge is pretty limited... so my wings and tail, for one thing, have a script in every prim. And since there's a tail and pair of wings for fly AND walk [mode], that's almost twice as many as you see at one time. 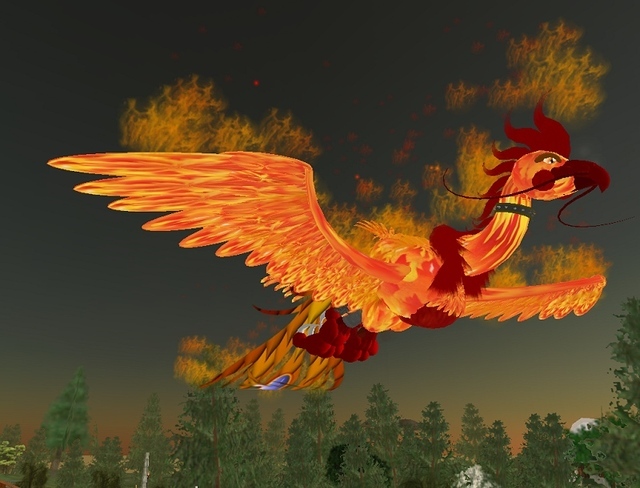 The phoenix isn't and never will be sold mostly because the incredible amount of scripts and terribly non-efficient code causes some distress in slower machines (I know this from first-hand experience). Perhaps I'll make a non-animated version in the future that is more client friendly. I'm a pretty friendly and gentle person I've been told (I hate fighting, I don't drink, I don't smoke, etc) and figured from the books that's a pretty pure thing. 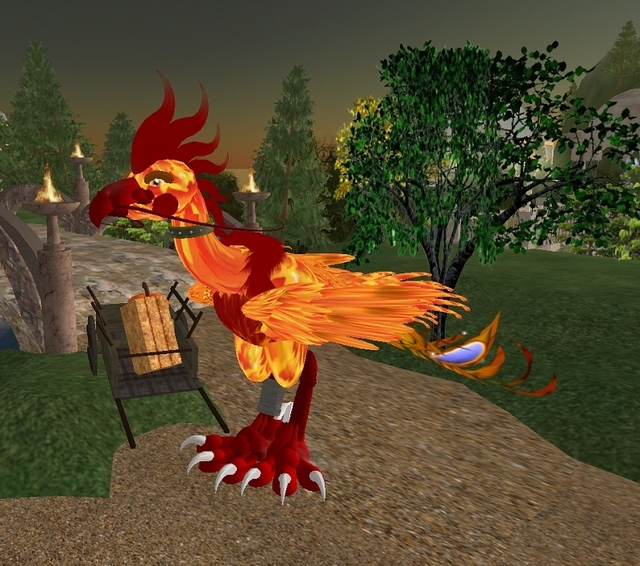 The phoenix is about as pure as birds get, and after reading all the various versions of the legends, I figured it was what I wanted to make in Second Life back in October of 2004. A greeter avatar based on something fantastic, but yet recognizeable, and gentle and down-to-earth. Dragons had been done to death, as did most other animals. [In SL] I tend to be sort of the "gentle presense", giving out hugs and trying to give folks new to Second Life a feeling that there's a friendly, sociable aspect in here and folks shouldn't judge the whole of SL by what aberrant behavior they may see in the first days. That, and act all confused and truly baffled when people call me a chicken. I mean, they don't fly, they don't got no tail like this. Perhaps some folks need corrective lenses. [T]he ability to blast solid projectile fireballs... [smiling] though they are not set to push or damage, and only have a 20-meter-range before they die. I salute Psyra, a purveyor of excellent SL culture. He's been such a familiar, comforting sight in (both designs of) the WA during my tenure in SL. I remember that time the WA Guidelines was put up in the old one, and Psyra explained how he checked it out with a Linden (I forget which one) that his av, including particle effects, was not disruptive to others. What consideration! Or the time where he talked about dragging a script into each prim. What dedication! In either case, I'm saying this in part because I'm *tremendously* enjoying his recent creation, a "Melonjay" he made in my favorite colors—I've fondly identified as another parallel-world'd Torley and named Torlavian. It's a fullcycle flight heading forwards, since he was one of the first avs I ever saw upon arriving on these shores. And now, featherively, I have become more like him. Hahaha I can relate to that all too well! I like the concept of 2D art becoming 3D. Psyra does this well *inspired* and metaversically speaking, people with excellent websites full of art, especially art of a 'classical' nature, are good for SL and the real world in general.